Alcohol. Tobacco. Firearms. 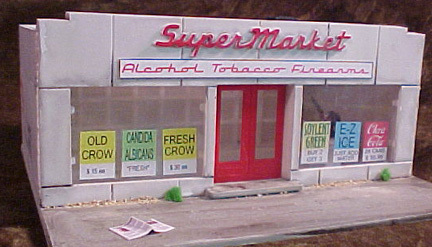 Your one-stop shopping palace. 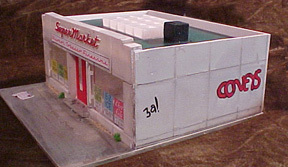 In a recent Plasticville lot I got the front (only) to the 'Small Supermarket', with the door still in place. This kit was last released in 1952, making it barely older than me. I made the building a bit over twice as deep as the original, with new walls and roof supports cut from Sintra. The sides have panel detail matching the front scribed in. I glazed the windows with clear plastic.To add interest, and to hide the fact that it's a big empty box, I added posters to the windows: They are printed on my computer, and liquid-cemented to the windows. The building looked gloomy & dark, so I decided to make a skylight. I cut pieces from a plastic grille intended to cover flourescent lights, and glued clear syrene to the bottom. I then glued it over a hole cut in the roof. 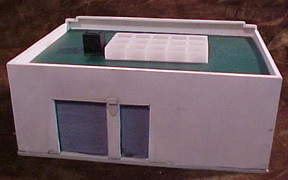 The a/c unit is a wooden block, intended as a lifting handle for the roof. The back has freight and access doors cut in, and doors glued in place. I actually scribed detail into them, but it's too delicate to show up in these pictures. The front sign was also printed on my computer and glued to thin styrene sheet. It was attached after the building was painted. 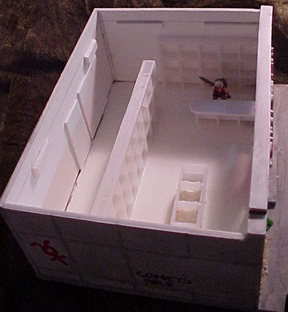 The shelving unit stands on a lego brick, and the cash desk has a styrene top. All very bland & white. The front sidewalk has a copy of the CoZoChron blowing around, some scatter, and a bit of greenery growing in the cracks. All in all, I'm quite pleased, especially given what I started with: A piece of plastic over half a century old. When glazing picture windows in Plasticville buildings look closely at the building. 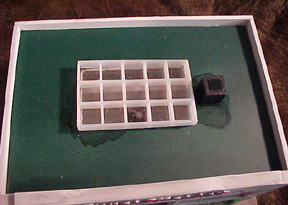 Usually, the back lugs are at the sides, and the top & bottom frame hold the 'glass' against them. So: Cut the glass only as wide as the opening, but a bit taller. Slide the window through, under the bottom lugs. Then slide it up against the top lugs, snapping it behind the window top. This is the easiest way to insert the 'glass' without cracking it.